Do you know the tamarack? It’s a coniferous tree that grows abundantly in Canada. Tamaracks are among my favourite trees! Once the many deciduous trees have impressed us with their spectacular fall dresses and then shed them, these modest trees – known as deciduous conifers, also called Tamarack (from Algonquian) and larch, suddenly explode into vibrant yellow colour! They are the only conifers in Canada whose needles change colour and also get dropped! I have been enthralled with these trees ever since I first learned of their unique quality years ago, when one of our older neighbours, Ross, told me about them. I love seeing these yellow lovelies along all the country roads I drive these days, when everything else begins to look more brown and grey and bare, before winter sets in. Last Thursday – October 27th – a large area of the Ottawa Valley received a surprisingly BIG amount of snowfall. Usually, the snow won’t show up in such amounts until well after all the fall colours have gone, the leaves have fallen, and things are looking grey and brown and muddy. If there IS an earlier snowfall, it’s usually quite light, and there is little snow accumulation, because the flakes melt mostly once they reach the ground. For some reason, this time there was a day-and-a-half’s worth of constant snowing with fall colours still vying for their rightful showtime. I went outside and took photos of this more unusual “collision” of the two seasons, including this one of our front steps with our as-yet-uncarved pumpkin on the one side and our cat, Hemingway, sitting momentarily….possibly contemplating whether going outside was a good idea in view of all that cold, wet snow everywhere. I just loved this image with it appearing as if our cat was looking away from the snowy scene and the pumpkin was also seemingly eyeing askance at all that intrusive, cold white stuff, but in the opposite direction. Surprise in my Compost Bin! As I’d go visiting my compost bin over the summer, I noticed at one point that a plant had taken root and was seemingly doing quite well. It had its share of sun, and I checked that it had enough moisture ie. water. The leaves and look of the plant puzzled me, so I didn’t know for a while what it would turn into, although I suspected perhaps a flowering plant? A few days ago, when I went to look again and saw that leaves were starting to wilt with the cooler autumn temperatures, I looked more closely and realized that what I had thought might be that Chinese lantern plant with its papery “flowers” was actually….a ground cherry plant!! I am relatively new to ground cherries, although ever since I first bought them via a farmer’s market a couple of years ago, I have become an avid eater of them! Whenever I find some, I will get a pint. They are usually sold with their delicately light, “papery” covers enveloping them (you can see some in the photo above). And the ground cherries quickly disappear on my drive back home. Yes, they are just SO good!! For nibbling! Tart and bursting with juice. I suppose that a stray seed from one ground cherry last year found its way into my compost bin and germinated this season…..? This modest-looking plant produced a good two dozen yummy ground cherries – that clearly was a gift from Mother Nature! Note: I just did some quick research. Ground cherries are classified under the name Physalis plant (in the nightshade family). And I have learned that there are some connections to the Chinese Lantern (aha! ), the tomatillo, and the native gooseberry. That explains a lot! I have bought tomatillos from a local organic farmer as well, and just recently I came across another farmstand selling the gooseberries. Gooseberries share a tartness to the ground cherry but have a little bit more sweetness in them. A view of White Lake early Tuesday morning….just after 7 a.m. As seen from Pickerel Bay. Before I got started with the work I had come to do, a movement in the sky caught my eye – a slow, gracefully soaring great blue heron; it has such a distinctive, unmistakable gliding style – I watched its flight for a few moments, then my eyes lowered to the horizon, and I noticed the mist on the lake water, and I was immediately entranced with the sense of peacefulness and calm. At the sight of the tranquil water…..the island reflections….the light pink hues created by the just rising sun……it could be the perfect spot for enchanted Avalon! These days as I drive along the country roads, I see more and more green trees looking as if painted with yellow, orange, or red dabs at the edges. It’ll be fun to watch over the next couple of weeks how the trees slowly change from green to more yellow, orange, or red until there is no more green to be seen. Then, outside of the evergreens, all the other trees are consumed by colour, and such a vibrant display it becomes. It’s a magic trick that nature plays on us! 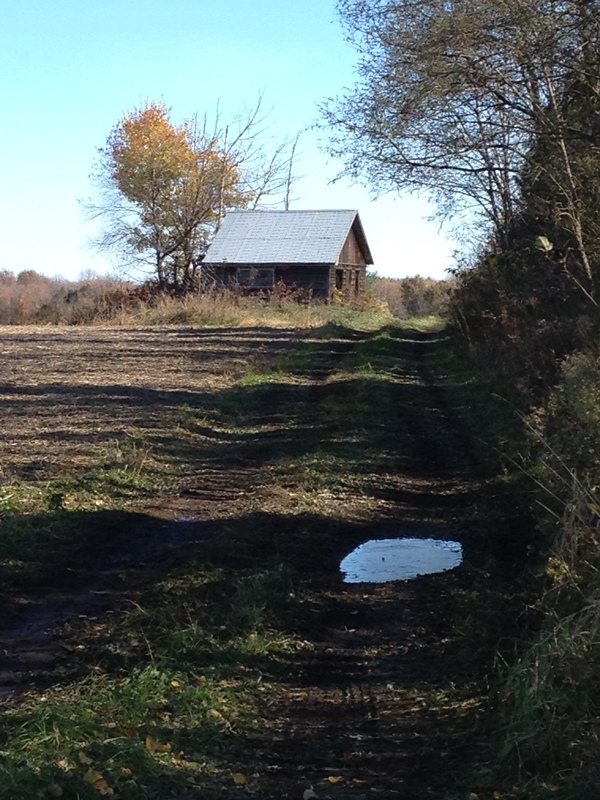 I have been enjoying my walks along this country road throughout this summer and into the fall. It has been an eye-opening experience for me to really see how much wondrous beauty I could find every day in this small area. And it isn’t always big, smack-in-your-face, eye-popping beauty. Much of it showed up in subtle ways. Almost as if it would just whisper to me, “look here, oh, and over there! What do you see?” I found beauty in the different trees, various wildflowers, occasional encounters with wildlife, and clouds in the sky that would set the mood from bright and cheerful to sombre and stormy…..with occasional sunsets mixed in. I took hundreds of photos on these walks, because every day brought new treasures to light, and I just HAD to capture them on camera. Funny, the silly notions we can have sometimes! When I first thought about starting these walks and deciding to take a specific route – initially mostly for the distance I hoped to walk, as well as the time it would take – the thought crossed my mind about how long it would be before I would get bored of seeing what I then thought would be the same old scenery every day. Little did I know…..just what kinds of surprises nature had in store for me! And she was a wonderful teacher…..as always. 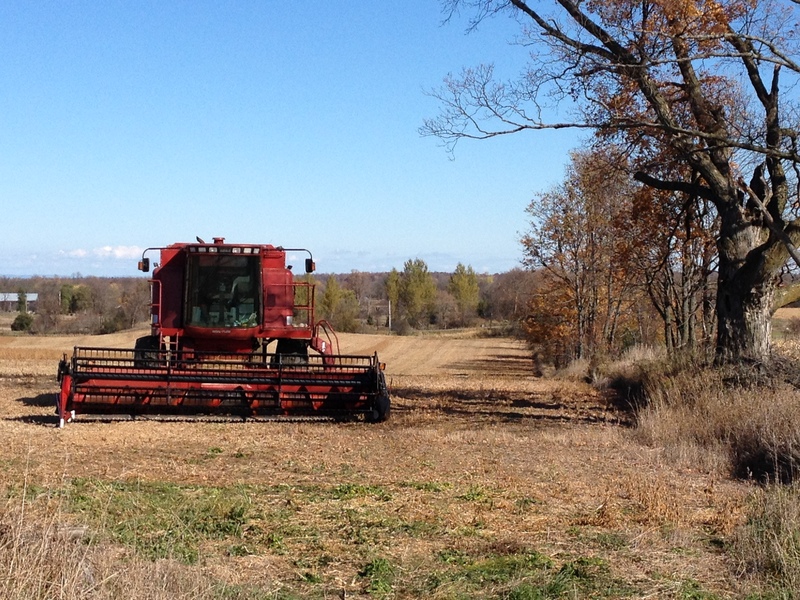 The top two pictures are of a farm machine – I believe it’s a combine? But I could be wrong, as I’m not that familiar with farm machinery. 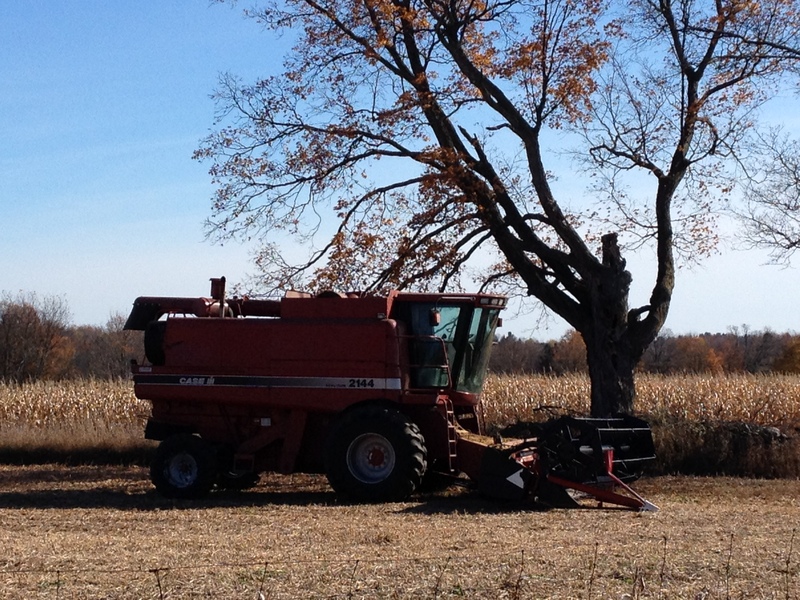 It was standing in the field, ready to go to work. I saw it on the first part of my walk, and when I was returning, someone had climbed into it and put it to good use in that field. 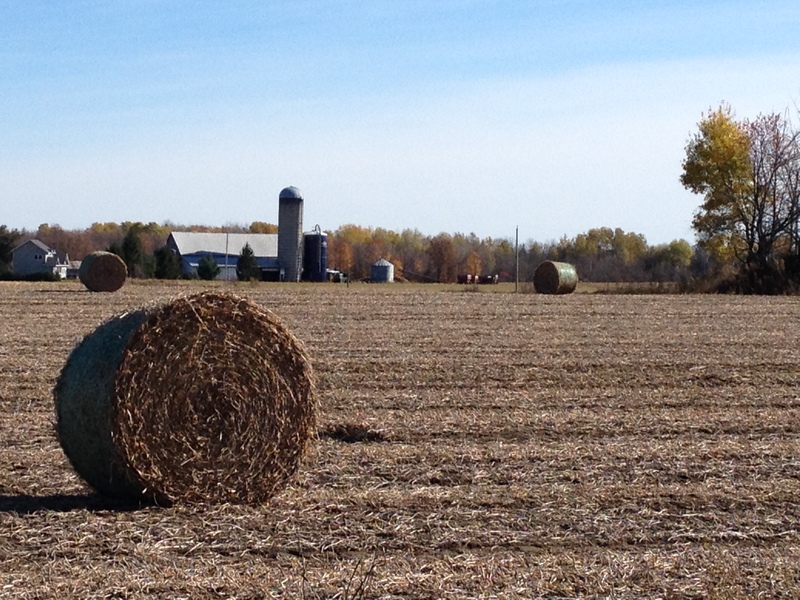 You can see all dried up cornstalks on the neighbouring field, still standing tall….not having been turned under yet. Then there was a field that had a late hay harvest – last one for this year – which must have fairly recently been baled and left to dry in the sun. I took another picture of my favourite little cabin by some woods and down a winding trail….with that ever-present rain puddle halfway up. That puddle never seemed to disappear. And I can look back at photos taken from late spring onwards…..of how that cabin and its immediate surroundings slowly changed over the days and weeks. 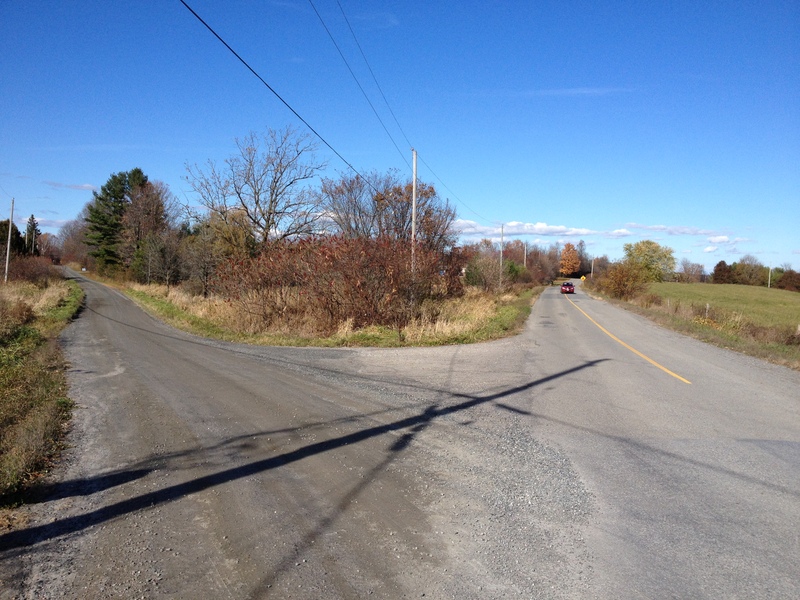 And finally a fun-angled photo of the two roads at that intersection…..one of which leads up to my home. I hope you enjoyed this short “walk” with me. Feel it in the air? 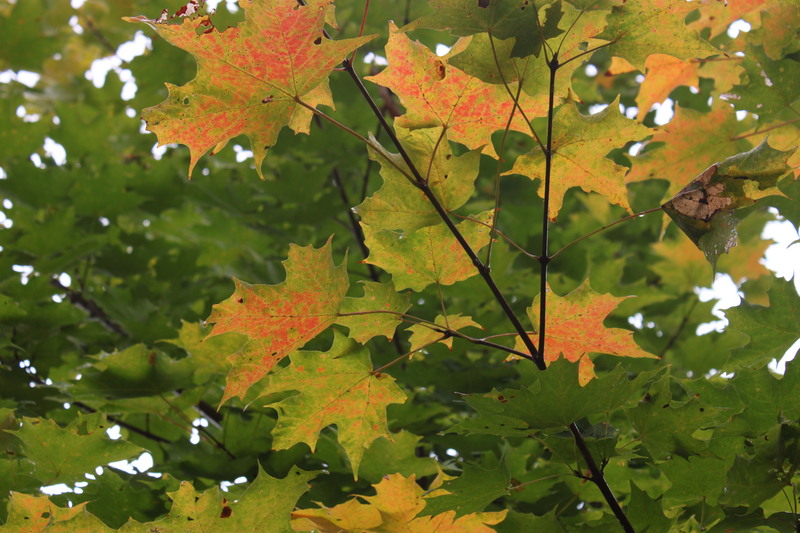 Note: I love how just a few of the leaves are showing their colour changes…in speckles….and with the still-green ones all around them. Note: These flowers are the ones that always whisper “autumn” to me. 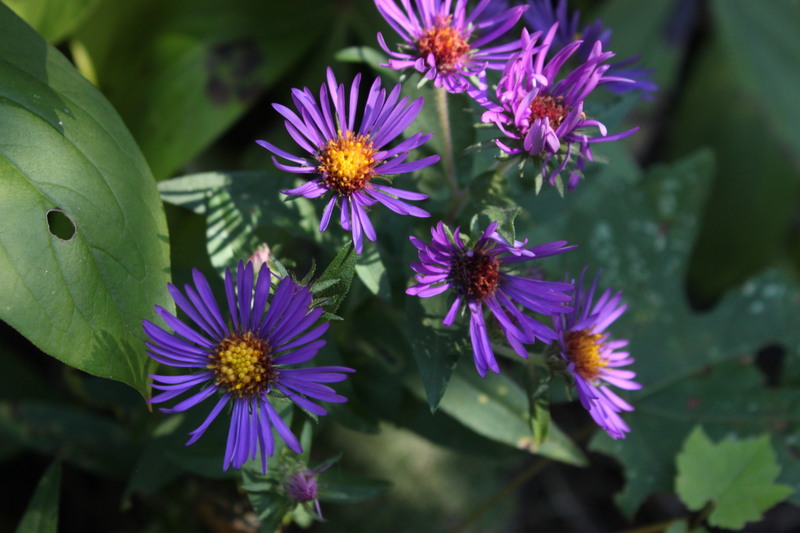 Those purple asters. I love them. Such a deep colour in a time of colour changes looming, particularly visible in so many kinds of tree leaves.